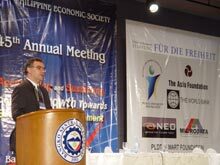 The Friedrich Naumann Foundation (FNF) supported The Philippine Economic Society’s 45th annual Conference at the Central Bank of the Philippines from 14 -16 November 2007. The theme for this year was: “Accelerating and Sustaining Economic Growth Towards Broad-based Development.” The event provided an excellent overview of the state of the economy of the country. It included a detailed discussion on the reliability of economic statistics by identifying positive and negative trends, current risks and providing valuable input on policy alternatives and development strategies. The highlight this year was the lecture delivered by professor Robert Mundell, 1999 Nobel Memorial Prize for Economic Sciences winner. The topic was “Economic Development by Fitting Globalization into the National Development Strategy.” He focused on exchange rate policies and their effects on the international financial system.